This is an XSL Speed Reporter exclusive interview with IZOD IndyCar Series driver Marco Andretti, pilot of the #26 Venom Energy car for Andretti Autosport. Forgive please for my few hours of delays but I was unsure how I wanted to format this unique pleasure of mine. I certainly hope loyal race fans, like yourselves, will enjoy the result. Driving the #26 Andretti Autosport vehicle for his 5th season in IRL's top open wheel racing series, Marco Andretti enters the 2010 IZOD IndyCar season with the #26 Venom Energy Dallara-Honda. The son of 42-time American open wheel race winner Michael Andretti and grandson of auto racing legend Mario Andretti, the youngest racing Andretti has found establishing his own mark in racing to be a lengthy trial. Upon entering the IndyCar Series in 2006, the weight of his famous last name weighed heavily on the third-generation driver. With his family heritage serving as a mixed blessing Marco entered with instant notoriety. Inspired to challenge naysayers who contest Marco Andretti presence in the series being earned only on his legacy, the 19-year old rookie passed the initial test. On his way to rookie of the year, Marco Andretti fell just 6/100ths of a second short of winning the 2006 Indianapolis 500. Dicing with his father in the late laps around the 2.5 mile Indianapolis Motor Speedway, Marco won over skeptics in the 2nd place performance that day. Fueled on momentum, Marco Andretti scored his first victory later in the year at the Infineon Raceway road course. While the early success of the 2006 IndyCar season allowed Marco Andretti to emerge like a lion, the seasons following the freshman run left the driver appearing like a lamb in comparison. Finishing 8th in the final points standings for 2009, the young Andretti's best finish came with a 4th place at Texas. However, this past IndyCar season was a disaster to the four-car Andretti-Green Racing (now Andretti Autosport) team. Enduring a challenging year in 2009, Marco Andretti enters the 2010 IZOD IndyCar Series reacting well to the changed complexion of tour schedule featuring a majority focus on road/street courses. "This season we have 9 road/street circuits and 8 ovals. The road and streets do out number the ovals, but I wouldn’t say that mean the Series has shifted to a majority focus. I do really enjoy driving road and street circuits because they really require you to work at the driving. There’s so much for to focus on it really keeps you on your toes. But the ovals have a speed and intensity all their own so I do think it’s important for the series to stay balanced." At the age of 23, it's hard to remind ourselves that Marco is still a very young talent racing in a big league of auto racing. Interesting in fact with four prior years and sixty-seven races of IndyCar competition, Marco's grandfather was 24 years old when his IndyCar career even started. 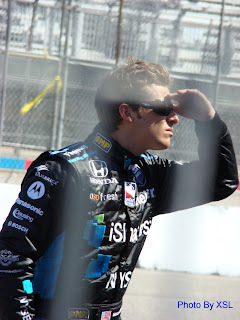 Entering into his 5th season of competition in the IndyCar series, he has learned since his 2006 rookie season that perseverance plays a major part in growing as a driver. "I think as a driver you learn new lessons every year. The biggest overall lesson I’ve learned is to never give up – it won’t always be easy but if you see it through and don’t give in you’ll always be better off." Unlike other drivers for the smaller teams on the IZOD IndyCar Series tour, the four-car team of Andretti Autosport provides Marco Andretti with a potential wealth of information. "Having three teammates is sometimes like having three siblings. Sometimes communication is a breeze and sometimes it’s not as easy – I think that’s just human nature though." Andretti states candidly. "My teammates and I always share track information. That’s the best part about being part of a four car team; I have three other drivers to bounce ideas around with. We each have our own driving style so what works for one of us may not be the best solution for everyone, but having someone on your side is always nice." 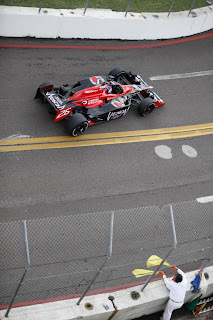 As the 2010 IZOD IndyCar Series season opening in Sao Paulo, the first round of Marco Andretti's fifth season ended after one corner in a collision that involved Mario Moraes running up over the #26 car. Two weeks later, the Honda Grand Prix of St Petersburg showed that Marco by leading a small portion of the event. Unfortunately, the #26 Venom Energy team front-running speed was thwarted by a tire problem to a 12th place finish. Placing the first two events aside for 2010, Andretti is attacking this season one race at a time refusing to predict at what venue the #26 would be seen strongest. "It’s really too early to tell exactly what will be our best race. We’ve had some strong showing on ovals in the past and we learned a lot about our road course set ups over the last season". Of course like every other driver on the schedule, Andretti was willing to offer a specific challenge to a particular Brickyard. "Personally I’d like to think Indy will be my best race – the Speedway and I have some unfinished business." Marco Andretti says. It's interesting to note that with this being an even numbered year, Marco Andretti is statistically backed for a strong Indy 500 in 2010. This season, Marco Andretti's plans will include a rendezvous with the Rebellion Racing team at the Le Mans 24-hour race. Driving a #12 Lola prototype powered by a Rebellion V-10 engine, Marco teams with Neel Jani and Nicolas Prost (son of Formula 1 great Alain Prost). All of these drivers have formally competed against each other in the A1 Grand Prix last year. Unfinished business for the Andretti clan, if Marco's team victory he will capture the only remaining honour in auto racing yet to be held by an Andretti. A definite way to place his own individual mark in auto racing. When asked how the deal developed to drive Le Mans, Andretti says "Fortunately they called my manager. And when my manager called me, I took the deal in a minute. I’m not sure how they picked me, but I raced with Nicolas Prost and Neel Jani in A1GP and I think they may have been the ones who pushed for me to be their third driver. It’s cool since it seems like I did something right over there. I’m honored to have been gotten the call and can’t wait to go over there and have some fun." In regards to comments for whether he would like to accumulate a racing resume similar to his grandfather, racing legend Mario Andretti, Marco quips "Sure, who wouldn’t? I’ve done some sport car driving and I really love that." However, on the topic of seeing another Marco Andretti becoming another open wheel driver jumping in NASCAR (such as former teammate Dario Franchitti and current Andretti Autosport comrade Danica Patrick), the 23-year old has firmly dismissed possibilities. "As for stock cars – that’s just not my thing." Although uninterested in stock car racing involvement, Marco Andretti has not ruled out involvement in the biggest league of open wheel racing; Formula 1. "I think every open-wheel driver has F1 in the back of their minds as an ultimate goal and I’d love to make it there some day. But you really have to be in the right position for that and the timing has to be right. 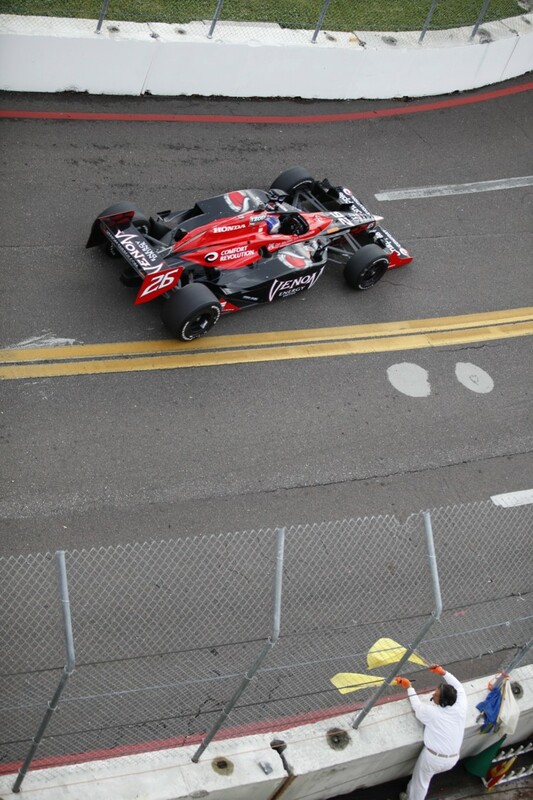 I just don’t think it’s my time yet and there are still things I’d still like to accomplish in the IZOD IndyCar Series." I extend my deepest thanks to Marco Andretti and Andretti Autosport for cooperating so I may present this article.